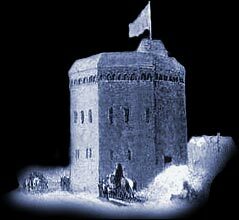 The Rose was built by Philip Henslowe in 1587, it was the first playhouse on the Bankside in Southwark. The Rose was Occupied by the Admiral’s Men, lead by Edward Alleyn, Philip Henslowe's son-in-law from 1594. In 1597 Alleyn retired from acting but still lead the company, three years later in 1600 The Admiral’s Men moved to the newly built Fortune playhouse. It is of note that Gabriel Spenser one on the company's actors was killed in a duel with the dramatist Ben Jonson in 1698, who many years later would be closely associated with Publication of Shakespeare's First Folio. After the Admiral's men left the Rose it was used by Worcester's men who had broken their contact with the owner of the Boar's Head at Whitechapel and lacked a venue and faced legal action. They remained at the Rose until the end of 1605, when, after becoming Queen Anne's men they moved to the recently built and licensed Red bull at Clerkenwell. The Rose is believed to have been demolished the following year. The Rose would have been built mainly of timber, with lath and plaster used for the walls, entries in Henslowe's accounts for bricklaying imply a brick foundation several feet above the ground to support the wooden walls. The stage was painted; there was a tiring house behind the stage, for the players to 'attire' or dress in, with a storage room known as the 'hut' over it, and a flagstaff to fly a flag on performance days. Stage size 15 ft deep by 32 ft wide.